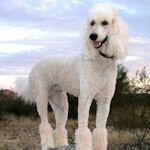 So You Want a Standard Poodle Dog Breed? Some people take one look at the fluffy, immaculately groomed Standard Poodles in the show ring and discount them as silly, shallow dogs. However, the Standard Poodle is considered by many people to be the most intelligent breed in the world, with the reasoning ability of a three year old child. These dogs may look like lightweights in the show ring, but they were originally bred to work hard in the water. The Standard Poodle spent hours retrieving water fowl for hunters and the breed's dense coat helped protect it from the cold, damp working conditions. Because the breed is not commonly used as a working dog today, The American Kennel Club classifies the Standard Poodle as part of the Non-Sporting Group. These dogs weigh 45 to 70 pounds and stand over 15 inches tall. The Standard Poodle has a muscular body under all of that hair. Its ears are long and fold over close to the head and its eyes are dark brown and filled with intelligence. This dog's tail is docked and stands erect. The tail should not curve over the dog's back. 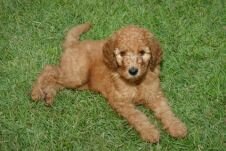 The Standard Poodle comes in a wide range of colors, including apricot, black, cream, red, blue, gray, silver, brown, parti-color, and white. 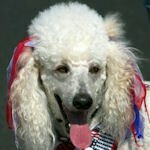 Overall, the white and cream colored Standard Poodles seem to be a bit more high strung and nervous than other colors, while black Standard Poodles seem calmer. 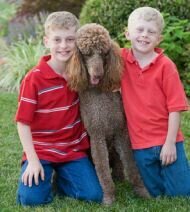 The Standard Poodle does best in family settings and is extremely devoted to its family's children. This breed also is an excellent choice for families with more than one dog, as the Standard Poodle rarely meets a dog it doesn't like. If you have a cat, be prepared for your dog to rampage through the house as he gives chase, although when he finally catches up to the cat, he will just want to play. If you live in an apartment, your dog will need to take a long walk or go for a romp in the park every day. These dogs can live in apartments, but do much better in a home with a fenced yard. Because of its high intelligence, this breed enjoys learning and should attend puppy obedience classes. 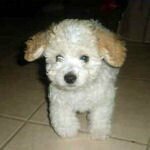 In addition, Standard Poodles need to be socialized as puppies, or their natural aloofness with strangers can turn to fear. Your puppy will work hard during classes, because he will want to please you. If he can't figure out what you want him to do, he will wrinkle his brow and try again. If he still can't figure it out, he may start to get depressed and frustrated. If this happens, give him a command that he already knows and after he joyously obeys he will be ready to try to learn the new command again. Many Standard Poodles and their owners go on to take advanced classes so that they can compete in obedience and agility trials. 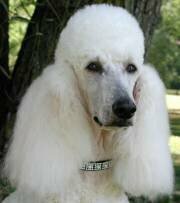 The Standard Poodle breed has several common health problems. Addison's disease, hip dysplasia, and epilepsy problems are prevalent enough that many breeders actually screen their parent dogs to be sure they don't carry these genetic faults. Your dog could also suffer from renal disease, bloat, and skin problems. Standard Poodles are big dogs and have big appetites. If you've never had a big dog before, be prepared for a noticeable increase in the grocery budget. These dogs also should receive a daily vitamin. 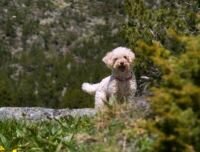 In addition, ask your veterinarian about giving your poodle a daily vitamin C tablet, which many veterinarians say can help decrease the chance of hip dysplasia. 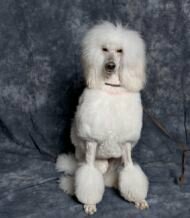 If you do not want to spend time grooming a dog, don't buy a Standard Poodle. These dogs need to be brushed daily, and, with their large size, it can take an hour or more to thoroughly brush out a Standard Poodle's coat. Also, you will have to learn to cut your poodle's hair or you will need to take him to a professional groomer every six weeks. The Standard Poodle is a fun loving, intelligent dog. If you don't mind brushing your dog instead of watching the news, this may be the breed for you.